Here at Wagg-On Dog Grooming, we take a pride in the service we provide to our customers – both doggy and human! Here are just some of the comments we have received from pet parents. “Hi Christine, just to say a huge thank you for Lexie’s pre birthday pamper. She smells lovely and is so soft. Sound asleep on the sofa now! We never thought she would make it to 10 so tomorrow, very special. Chicken cooked tonight for her. Do put on your website how much we love what you do. We can’t praise you enough, you treat them as your own. “Hi Christine, just a thank you for great service yesterday. 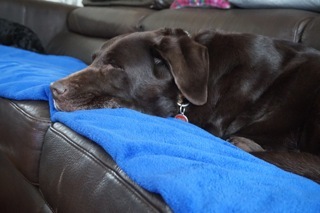 Lexie so relaxed after bath, fell asleep! Smells great and so soft. Many thanks. Oh, and we love her photo! Look forward to next time”.